For those of you with a sweet tooth, here is your source for all sorts of treats that use your fridge/freezer. 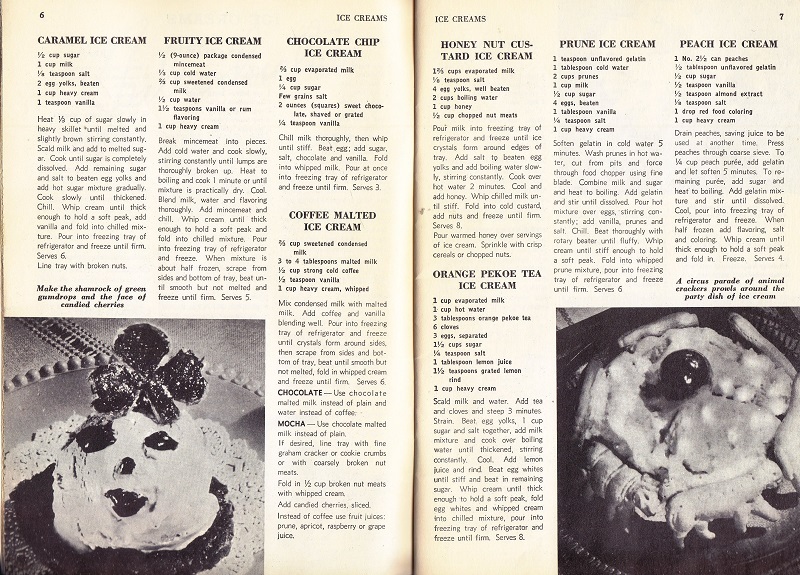 Of course there are recipes for ice cream, Baked Alaskas, cookies, pies and puddings. Unfortunately, the black and white photography doesn’t really help with appeal factors. The cover shot is ice cream, in case you didn’t recognize the food. (I had to look several times to be sure). However, if you like your food with a creepy face, check out the second picture after the text. 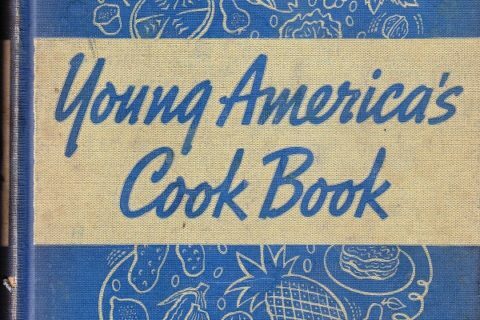 Yay, another vintage cookbook! Ahem though, prune ice cream ??? 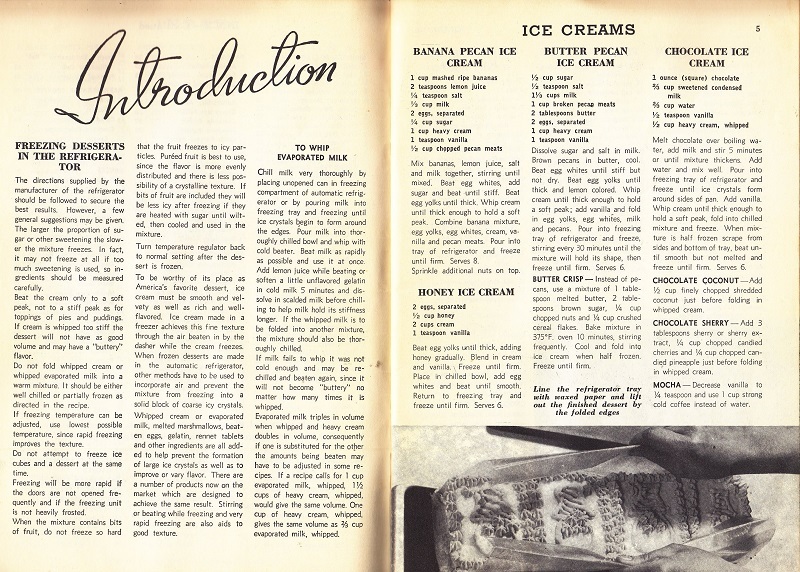 No 1950s cookbook is complete without Prune Whip, so no surprises there. 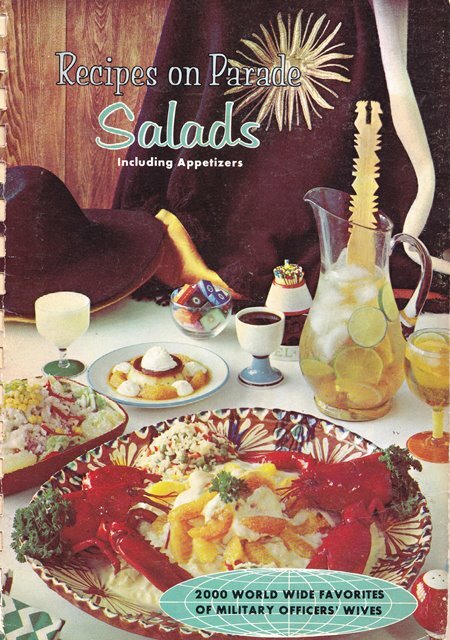 The cover desert looks like scoops of ham salad on peach pie….mmm mm mm. 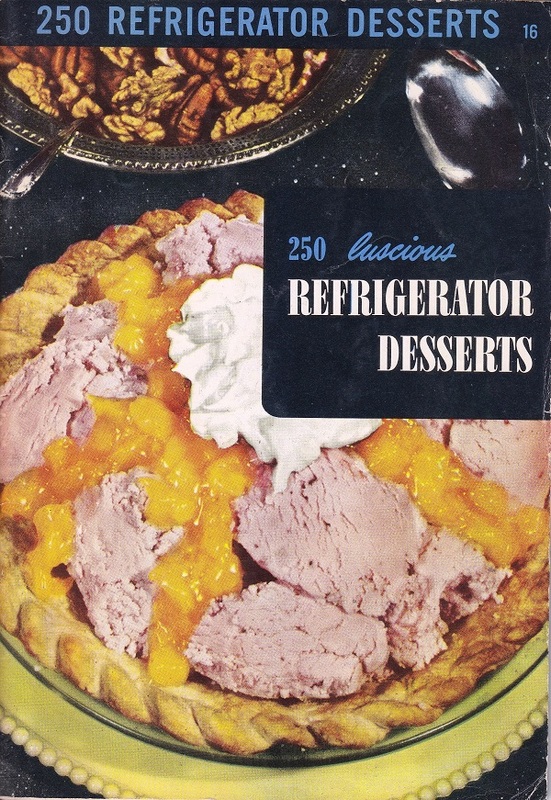 I thought the ice cream looked like slices of pork loin covered in can peaches. Yes! But I think it’s creamed corn. Does anyone else think the ice cream on the cover looks like canned dog food? I have to wonder whether the color printing technology of the time was really this bad or whether the cover has faded over time. 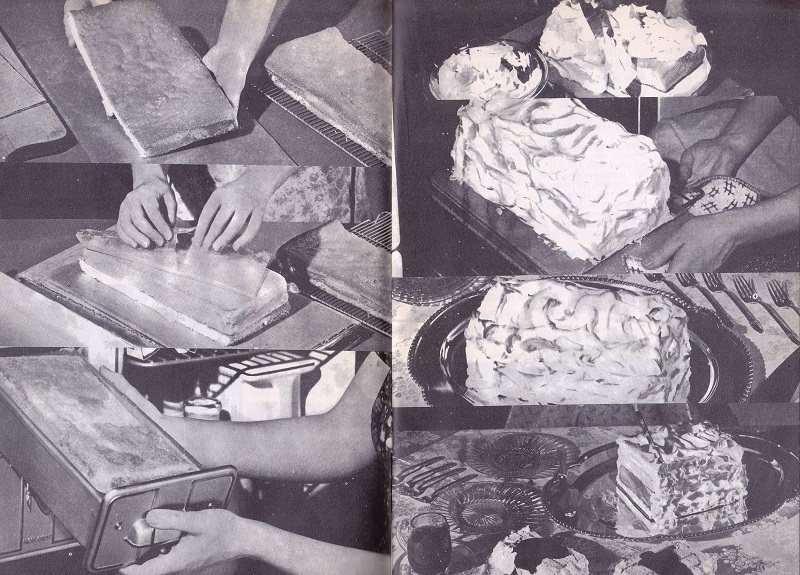 color printing technology changes, cover fading, and most importantly, there were no artificial colors added to the ice cream (it probably was not as brightly colored as things tend to be now). In the twenties, ownership of a true electric fridge was a sign of financial success, and a lot of gourmet cook books for “refrigerator recipes” targeted the upper middle class housewife. 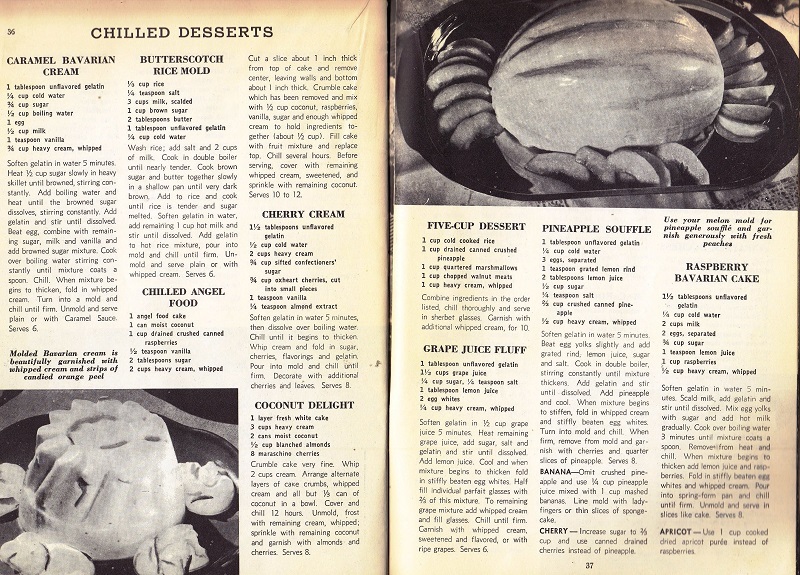 By the 1950s, these were filtering down to a mass audience, so you get cheaper publications with the same recipes. I suppose it’s too late to point out that some of us read ALB over breakfast. What is that pan on the third page (the page without any text)? It looks like a card catalog drawer. It appears to be a drawer from an OLD refrigerator, which I am to believe often had such “mold dish” drawers designed just for such things as “refrigerator desserts”……..
My friend’s mother’s refrigerator came with individual metal dessert dishes that looked like little footed bathtubs. Ah, the good old days when people made their ice cream by hand and used all-natural ingredients instead of some — wait, mincemeat and prune ice cream?? Ewwwww! Dog food? I thought it looked more like Play-Doh! Lol! Is that an Irish panda? 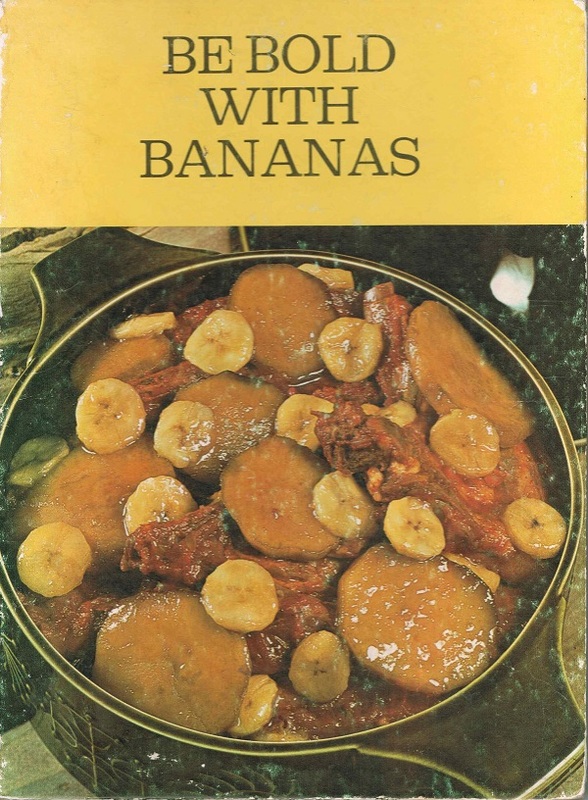 Well, for all you haters, I happen to have this book and think there are some pretty good recipes here! 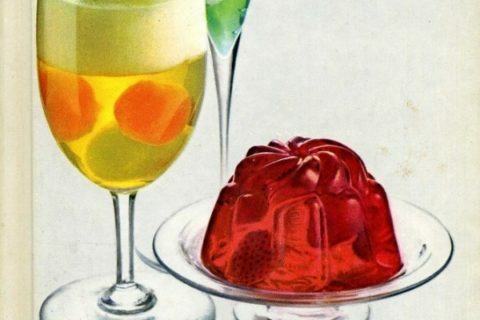 If you actually read it you can see a good recipe beyond old photos! It’s good for a personal collection but not a library.